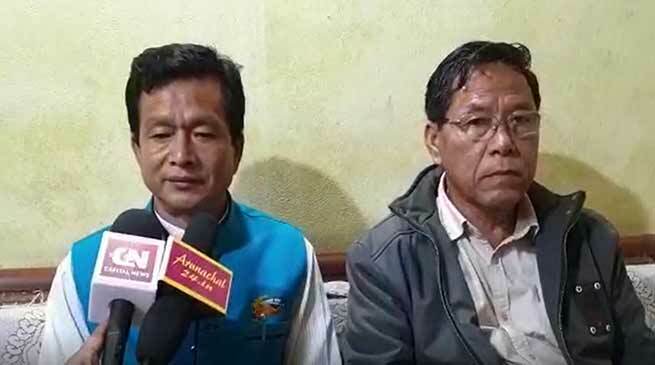 Arunachal Pradesh Catholic Association (APCA) today apologised the people for issuing of its prayer petition seeking vote in favour of Nabam Tuki. APCA President Taw Tabin while interacting to media said that a prayer note was issue to the members of church and its followers for organising prayers with regards to the ensuing election 2019. A ‘Show cause notice’ was received through whatsApp from Nirvachan Bhawan today as the letter is viral in social media and we hereby withdraw this letter ‘prayer note’. He said that there was no any intention to hurt any other people or any political party sentiment as due to ensuing election is in progress. Our prayer petition was not to hurt anybody sentiment at this juncture. Tabin said. If it have hurt anybody sentiment we sincerely apologise and there was no other intention. Tabin added. APCA Secretary General Nabam Pekhi while said that there was no ulterior motive but such practice is being done for every believers for a good beginning and also for conduct of the election in peaceful way, however it comes to social media and people are making unnecessary a big issue, if the letter in any way have touched any sentiment to any community and party we sincerely apologise for the mistake we did. It is to mentioned that a letter ‘prayer petition’ was issued by APCA Secretary General Nabam Pekhi on March 29 which goes viral in social media and also Minister of state (Home) and BJP candidate for 1 Arunachal West Parliamentary constituency Kiren Rijiju writes in his time line ‘ we all are also children of god who never discriminate anyone…..’. A Show cause notice was served by Nirvachan Bhawan vide No-EN/Leg/79/2019 was issued to Pekhi Nabam, Secretary General, APCA to withdraw the said prayer petition today itself with due apology, failing which necessary action as per law shall be imitated. This is a corrupt practise under section 123 of the Representation of People Act, 1951, while section 171 C of the Indian Penal Code (IPC) makes under influence at election as punishable offence, the show cause notice stated. Later the team of APCA withdraw the prayer petition and submitted a letter to the effect to Nirvachan today afternoon stating ‘ the prayer petition which goes viral was not the intention of campaigning in favour of Nabam Tuki but to pray for peaceful conduct of election, and the said prayer petition stand is hereby stand withdrawn with immediate effect, and do hereby apologise before the chief election officer and to general public of Arunachal Pradesh, the letter added.